Update: HTC's CEO has revealed we're in for some major Vive news at CES 2016. HTC, together with Valve, made a "a very, very big technological breakthrough" with the headset earlier this month, and plans to demo the advancement at CES. This could mean the company plans to reveal the redesigned headset and controllers, along with any associated improvements, or something else entirely. We'll be sure to bring you all the latest from the show. 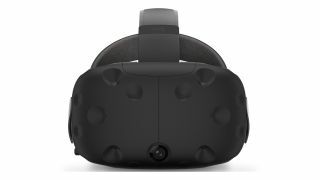 We're expecting HTC and Valve to reveal the second-generation Vive virtual reality headset at CES 2016, but thanks to some eagle-eyed Redditors we've just got ourselves an early look. A bit of detective work on the Vive developer site unearthed some intriguing new pictures, revealing what we assume to be the updated headset and controllers. Starting with the headset, the new design looks far more consumer-friendly: the overall design is smoother and the sensors are now hidden; the wires are now obscured by an additional head strap; the HTC logo has been taken off the front; and there's also now a camera sat at the bottom centre. As for the controllers, the main thing of note is that the hexagonal satellite heads have been replaced with circular ends, and again it appears that the sensors have been covered. The touch pad and button placements have also been tweaked, probably for the sake of comfort. Overall, the whole thing looks a lot better than the existing developer version, however we can't guarantee these renders are a 100% accurate representation of what's to come - you'll just have to wait until CES to see. If they are the real deal (which seems likely) then it's highly possibly that we're not just looking at an updated developer model, but the final consumer version of the HTC Vive. We've contacted HTC for comment. It was recently announced that the consumer version of the HTC Vive won't launch until April 2016. The Oculus Rift and Sony's PlayStation VR are also on track to launch in the first half of next year.